them until it came to rest over the place where the child was. they offered him gifts, gold and frankincense and myrrh." I love Christmas time. It has always been my favourite. I keep these stars up to remind me of this season all year round. Each one has its own sentimental place for me. The small gold star reminds me of the tradition my Mom started of giving me a new tree ornament every year in December. I cherish each one. The large gold star was a gift from a dear friend of my Mom's, Joyce Fishwick, who I spent Christmas with in Germany of my Matric year. She passed away a year and a half later from cancer, and those Christmas memories of sharing stories, lebkuchen, blazing fires, snow and weihnachtsmarkts will always hold a very special place in my heart. 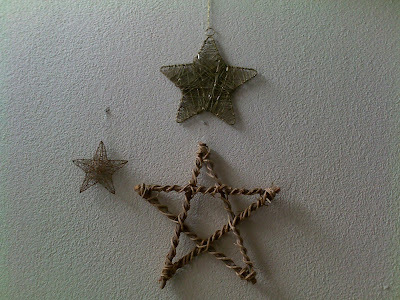 The large wooden star reminds me to hold on to the simplicity and true spirit of Christmas. For those who view the Bible as a religious text, or just a historical one. Even for those who just think that the Bible is just some fantastical story book, I like to think that its words hold unique value to each of us. Jesus was born in a mere stable. His coming was the true gift of Christmas. Therefore, the value of Christmas lies in the people, not the gifts.